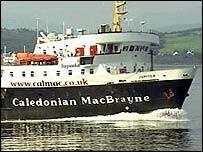 The future of one of Scotland's best known firms - Caledonian MacBrayne - will be settled by next summer after MSPs invited bids for its ferry routes. The Scottish Executive said the 24 Clyde and Hebrides routes had to be put out to tender to comply with EU rules. Scottish Executive-owned CalMac will have to fight off the world's biggest ship management firm, VShips. Transport Minister Tavish Scott said the competition process would result in more sailings and better timetables. Last year, the 24 services cost the executive £32m. However, the process began under a cloud after the first tendering exercise - for the Gourock-Dunoon crossing - failed to attract any bids, even from CalMac itself. The executive said it was seeking an operator which offered best value on an enhanced service. Islay, Mull, Arran, Coll and Tiree will get extra sailings and a new £20m ferry is being commissioned for Islay. CalMac has been operating in Clyde and Hebridean communities for 150 years. Mr Scott said: "More sailings, a new ship and better timetables to meet local needs are improvements that will happen as a result of this tender."